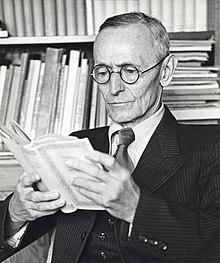 Steppenwolf is a 1927 novel by German author Hermann Hesse. He gave at the very first glance the impression of a significant, an uncommon, and unusually gifted man. His face was intellectual, and the abnormally delicate and mobile play of his features reflected a soul of extremely emotional and unusually delicate sensibility. When one spoke to him and he, as was not always the case, dropped conventionalities and said personal and individual things that came out of his own alien world, then a man like myself came under his spell on the spot. He had thought more than other men, and in matters of the intellect he had that calm objectivity, that certainty of thought and knowledge, such as only really intellectual men have, who have no axe to grind, who never wish to shine, or to talk others down, or to appear always in the right. Steppenwolf threw me a quick look, a look which criticized both the words and the speaker of them—an unforgettable and frightful look which spoke volumes! It was a look that did not simply criticize the lecturer, annihilating the famous man with its delicate but crushing irony. That was the least of it. It was more sad than ironical; it was indeed utterly and hopelessly sad; it conveyed a quiet despair, born partly of conviction, partly of a mode of thought which had become habitual with him. This despair of his not only unmasked the conceited lecturer and dismissed with its irony the matter at hand, the expectant attitude of the public, the somewhat presumptuous title under which the lecture was announced—no, the Steppenwolf’s look pierced our whole epoch, its whole overwrought activity, the whole surge and strife, the whole vanity, the whole superficial play of a shallow, opinionated intellectuality. And alas! the look went still deeper, went far below the faults, defects and hopelessness of our time, our intellect, our culture alone. It went right to the heart of all humanity, it bespoke eloquently in a single second the whole despair of a thinker, of one who knew the full worth and meaning of man’s life. It said: See what monkeys we are! Look, such is man! and at once all renown, all intelligence, all the attainments of the spirit, all progress towards the sublime, the great and the enduring in man fell away and became a monkey’s trick! “This morning I came on a passage in Novalis. … ‘Most men will not swim before they are able to.’ Is not that witty? Naturally, they won’t swim! They are born for the solid earth, not for the water. And naturally they won’t think. They are made for life, not for thought. Yes, and he who thinks, what’s more, he who makes thought his business, he may go far in it, but he has bartered the solid earth for the water all the same, and one day he will drown.” … He was so convinced and conscious of his isolation, his swimming in the water, his uprootedness, that a glimpse now and then of the orderly daily round … acted on him as a stimulus without in the least arousing his scorn. … He actually really admired and loved our little bourgeois world as something solid and secure, as the home and peace which must ever remain far and unattainable, with no road leading from him to them. There is much to be said for contentment and painlessness, for these bearable and submissive days, on which neither pain nor pleasure is audible, but pass by whispering and on tip-toe. But the worst of it is that it is just this contentment that I cannot endure. After a short time it fills me with irrepressible hatred and nausea. In desperation I have to escape and throw myself on the road to pleasure, or, if that cannot be, on the road to pain. When I have neither pleasure nor pain and have been breathing for a while the lukewarm insipid air of these so-called good and tolerable days, I feel so bad in my childish soul that I smash my moldering lyre of thanksgiving in the face of the slumbering god of contentment and would rather feel the very devil burn in me than this warmth of a well-heated room. A wild longing for strong emotions and sensations seethes in me, a rage against this toneless, flat, normal and sterile life. … What I always hated and detested and cursed above all things was this contentment, this healthiness and comfort, this carefully preserved optimism of the middle classes, this fat and prosperous brood of mediocrity. Solitude is independence. It had been my wish and with the years I had attained it. It was cold. With our Steppenwolf it was so that in his conscious life he lived now as a wolf, now as a man, as indeed the case is with all mixed beings. But, when he was a wolf, the man in him lay in ambush, ever on the watch to interfere and condemn, while at those times that he was a man the wolf did just the same. For example, if Harry, as man, had a beautiful thought, felt a fine and noble emotion, or performed a so-called good act, then the wolf bared his teeth at him and laughed and showed him with bitter scorn how laughable this whole pantomime was in the eyes of a beast, of a wolf who knew well enough in his heart what suited him, namely, to trot alone over the Steppes and now and then to gorge himself with blood or to pursue a female wolf. Then, wolfishly seen, all human activities became horribly absurd and misplaced, stupid and vain. But it was exactly the same when Harry felt and behaved as a wolf and showed others his teeth and felt hatred and enmity against all human beings and their lying and degenerate manners and customs. For then the human part of him lay in ambush and watched the wolf, called him brute and beast, and spoiled and embittered for him all pleasure in his simple and healthy and wild wolf’s being. All who got to love him, saw always only the one side in him. Many loved him as a refined and clever and interesting man, and were horrified and disappointed when they had come upon the wolf in him. And they had to because Harry wished, as every sentient being does, to be loved as a whole and therefore it was just with those whose love he most valued that he could least of all conceal and belie the wolf. There were those, however, who loved precisely the wolf in him, the free, the savage, the untamable, the dangerous and strong, and these found it peculiarly disappointing and deplorable when suddenly the wild and wicked wolf was also a man, and had hankerings after goodness and refinement, and wanted to hear Mozart, to read poetry and to cherish human ideals. These men, for whom life has no repose, live at times in their rare moments of happiness with such strength and indescribable beauty, the spray of their moment’s happiness is flung so high and dazzlingly over the wide sea of suffering, that the light of it, spreading its radiance, touches others too with its enchantment. Thus, like a precious, fleeting foam over the sea of suffering arise all those works of art, in which a single individual lifts himself for an hour so high above his personal destiny that his happiness shines like a star and appears to all who see it as something eternal and as a happiness of their own. As every strength may become a weakness (and under some circumstances must) so, on the contrary, may the typical suicide find a strength and a support in his apparent weakness. … Harry … fashioned for himself out of this tendency a philosophy that was actually serviceable to life. He gained strength through familiarity with the thought that the emergency exit stood always open, and became curious, too, to taste his suffering to the dregs. If it went too badly with him he could feel sometimes with a grim malicious pleasure: I am curious to see all the same just how much a man can endure. If the limit of what is bearable is reached, I have only to open the door to escape. There are a great many suicides to whom this thought imparts an uncommon strength. The Steppenwolf stood entirely outside the world of convention, since he had neither family life nor social ambitions. He felt himself to be single and alone, whether as a queer fellow and a hermit in poor health, or as a person removed from the common run of men by the prerogative of talents that had something of genius in them. Deliberately, he looked down upon the ordinary man and was proud that he was not one. Nevertheless his life in many aspects was thoroughly ordinary. … He was secretly and persistently attracted to the little bourgeois world, to those quiet and respectable homes with tidy gardens, irreproachable stair-cases and their whole modest air of order and comfort. It pleased him to set himself outside it, with his little vices and extravagances, as a queer fellow or a genius, but he never had his domicile in those provinces of life where the bourgeoisie had ceased to exist. He was not at ease with violent and exceptional persons or with criminals and outlaws, and he took up his abode always among the middle classes, with whose habits and standards and atmosphere he stood in a constant relation, even though it might be one of contrast and revolt. Man is not yet a finished creation but rather a challenge of the spirit, a distant possibility dreaded as much as it is desired. Man designs for himself a garden with a hundred kinds of trees, a thousand kinds of flowers, a hundred kinds of fruit and vegetables. Suppose, then, that the gardener of this garden knew no other distinction than between edible and inedible, nine-tenths of this garden would be useless to him. He would pull up the most enchanting flowers and hew down the noblest trees and even regard them with a loathing and envious eye. This is what the Steppenwolf does with the thousand flowers of his soul. Just as I dress and go out to visit the professor and exchange a few more or less insincere compliments with him, without really wanting to at all, so it is with the majority of men day by day and hour by hour in their daily lives and affairs. Without really wanting to at all, they pay calls and carry on conversations, sit out their hours at desks and on office chairs; and it is all compulsory, mechanical and against the grain, and it could all be done or left undone just as well by machines; and indeed it is this never-ceasing machinery that prevents their being, like me, the critics of their own lives and recognizing the stupidity and shallowness, the hopeless tragedy and waste of the lives they lead. ... Let no one think that I blame other men, though now and then in these pages I scorn and even deride them, or that I accuse them of the responsibility of my personal misery. But now that I have come so far, and standing as I do on the extreme verge of life where the ground falls away before me into bottomless darkness, I should do wrong and I should lie if I pretended to myself or to others that that machine still revolved for me and that I was still obedient to the eternal child’s play of that charming world. There he lives, I thought, and carries on his labors year by year, reads and annotates texts, seeks for analogies between western Asiatic and Indian mythologies, and it satisfies him, because he believes in the value of it all. He believes in the studies whose servant he is; he believes in the value of mere knowledge and its acquisition, because he believes in progress. … He is a good, unthinking, happy child, who takes himself seriously; and, in fact, he is much to be envied. Why was it, do you think, I was able to recognize you and understand you? … Because it’s the same for me as for you, because I am alone exactly as you are, because I’m as little fond of life and men and myself as you are and can put up with them as little. There are always a few such people who demand the utmost of life and yet cannot come to terms with its stupidity and crudeness. … You are surprised that I should be unhappy when I can dance and am so sure of myself in the superficial things of life. And I, my friend, am surprised that you are so disillusioned with life when you are at home with the very things in it that are the deepest and most beautiful, spirit, art, and thought! That is why we were drawn to one another and why we are brother and sister. I am going to teach you to dance and play and smile, and still not be happy. And you are going to teach me to think and to know and yet not be happy. Harry, the thinker, is a hundred years old, but Harry, the dancer, is scarcely half a day old. It’s he we want to bring on, and all his little brothers who are just as little and stupid and stunted as he is. You have a picture of life within you, a faith, a challenge, and you were ready for deeds and sufferings and sacrifices, and then you became aware by degrees that the world asked no deeds and no sacrifices of you whatever, and that life is no poem of heroism with heroic parts to play and so on, but a comfortable room where people are quite content with eating and drinking, coffee and knitting, cards and wireless. And whoever wants more and has got it in him—the heroic and the beautiful, and the reverence for the great poets or for the saints—is a fool and a Don Quixote. Good. And it has been just the same for me, my friend. I was a gifted girl. I was meant to live up to a high standard, to expect much of myself and do great things. I could have played a great part. I could have been the wife of a king, the beloved of a revolutionary, the sister of a genius, the mother of a martyr. And life has allowed me just this, to be a courtesan of fairly good taste, and even that has been hard enough. That is how things have gone with me. For a while I was inconsolable and for a long time I put the blame on myself. Life, thought I, must in the end be in the right, and if life scorned my beautiful dreams, so I argued, it was my dreams that were stupid and wrong headed. But that did not help me at all. And as I had good eyes and ears and was a little inquisitive too, I took a good look at this so-called life and at my neighbors and acquaintances, fifty or so of them and their destinies, and then I saw you. And I knew that my dreams had been right a thousand times over. Do you think I can’t understand your horror of the fox trot, your dislike of bars and dancing floors, your loathing of jazz and the rest of it? I understand it only too well, and your dislike of politics as well, your despondence over the chatter and irresponsible antics of the parties and the press, your despair over the war, the one that has been and the one that is to be, over all that people nowadays think, read and build, over the music they play, the celebrations they hold, the education they carry on. You are right, Steppenwolf, right a thousand times over, and yet you must go to the wall. You are much too exacting and hungry for this simple, easygoing and easily contented world of today. You have a dimension too many. Whoever wants to live and enjoy his life today must not be like you and me. Whoever wants music instead of noise, joy instead of pleasure, soul instead of gold, creative work instead of business, passion instead of foolery, finds no home in this trivial world of ours.